Have you seen this poster around Cathedral and St. Casimir? For those who haven't, The Winona HIMS are giving a concert, "There's a Meetin' Here Tonight", at the Winona Middle School, Friday Sept. 18th (7 pm) and Saturday Sept. 19th (2 pm & 7 pm). They'll also be hosting guest artists Wildflower and Keli Burchill. Tickets are $10 each and the proceeds go to Winona Volunteer Services and the Ready-Set School programs. Tickets are available at Midtown Foods, Daniel's Ace Hardware, and Hardt's Music as well as from any HIMS member. You may call 507-458-3949 or visit www.winonahims.org for more information. 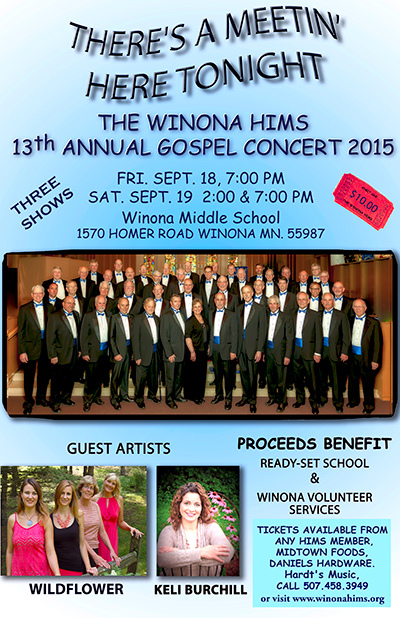 Please join us as we support these talented artists and their charitable gift of music for the needy of Winona. See you at the "meetin' "!